This is the campaign log for the twelfth session of a google+run Wandering Heroes of Ogre Gate campaign. The previous session is described HERE. Note: I am running two campaigns in the same setting and treating them as occurring in different realities with some vague similarities. Characters in one may appear in the other, but there are no direct causal effects from one campaign to the next. Partly this is to playtest, but this is also partly due to the multi-dimensional aspect of the universe I run all my games in. It would theoretically be possible for the party from the Blood of the Demon Moon cult campaign to dimension travel to the Secret of Je Valley Campaign, in which case direct interactions could occur (and they could even meet their counterparts in the alternate dimension). Bone Breaker returned to Ogre Gate Inn with Princess Samga as his prisoner after bringing the Face of Vaagu to Senior Grand Councilor Cai Yuanyu. Once there he and the party began preparations to host a tournament. They had decided to use the Wind Saber (which they'd taken from Mystic Sword Temple) as the prize. However when Jade Priestess inspected it, she discovered it was a fake. 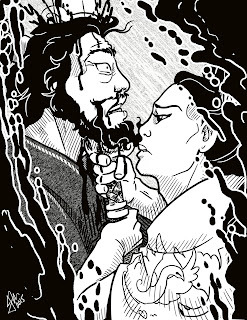 This enraged Bone Breaker who quickly assumed that Lady Plum Blossom had tricked him and swore to wipe out their sect. Shortly after, Gentle Demon, the leader of Zhaoze valley arrived for a meeting to discuss training the Que Pan Bandits. He explained that he could train them, but they would have to adhere to a strict meatless diet. He also said his price would involve the party paying him with rare and unique pieces of art. They were able to find the Flute of Xian Nu Shen in the antique shop General Dee had transferred to them in Fan and Gentle Demon deemed this satisfactory payment. He agreed to remain for six months to help train their men and immediately moved into the training and combat performance facilities the party had constructed. About a week later, Prince Gol, leader of the Kailin, came to the inn with an army of 40,000 horsemen to take back his sister. The party sent Sand Demon out ahead as a precaution and met with Prince Gol in a neutral space. The Prince agreed to come to the inn and talk terms. While there, Bone Breaker accidentally revealed that he had the Face of Vaagu and Prince Gol flew into a rage. There was a brief melee as the Prince tried to kill Bone Breaker but he was subdued. The party tried to convince Prince Gol to let them use his forces in exchange for the safety of the Princess and return of the Face of Vaagu. This didn't work, they threatened him with amputation forcing him to summon his wives and children to the inn. Once the wives and children of Prince Gol were present, Bone Breaker performed Tattoo of the Demon King on them. With this ritual he rendered an image of the demon emperor on their skin and with a word could kill them all from any distance. This threat, combined with their holding of the Face of Vaagu, compelled Prince Gol to agree to their demands and he vowed to lend his forces to an attack on Purple Cavern Sect and others in the Banyan. Just before they left, Senior Grand Councilor Cai Yuanyu came to the inn and explained to the party that he would need the Face of Vaagu for several more months. He also spoke to Bone Breaker saying he had tried to work out an arrangement with Heavenly Palace Sect (who had shortened Bone Breakers life to just five more years in exchange for making the land around the Inn fertile). The Senior Grand Councilor said he may have found a solution but he would need Bone Breakers help with something soon in order to make it possible (but he refused to elaborate). Also before leaving they had sent a message to General Dee asking for greater payment for the heads of the outlaws he wanted dead. General Dee agreed to pay a much higher price for each head.They also made preparations and paid an official for his orchard land in Fan. This they gave to the Flying Phantoms as they had requested. Then they headed south with two aims. The first was to go to Zhaoze Island and meet with Huo Si, the Venom of Zhaoze. Bone Breaker wanted to ask for his daughter's hand in marriage. The second aim was to wipe out all of Purple Cavern and get the Wind Saber of Sunan back. So they marched south with an army of 40,000 Kailin forced into their service. At Zhaoze Sect they met the Venom of Zhaoze who initially dismissed Bone Breaker due to his missing arm. The Venom of Zhaoze spoke privately with San and Chen to establish Bone Breaker's credentials. He was pleased enough that he allowed Bone Breaker to meet his daughter, Little Venom. At first meeting she questioned his skill, finding him unimpressive. To test him, she attacked and they sparred for a while. She got angry enough to try to kill him and this forced Bone Breaker to use greater force than he wanted. After the fight, Little Venom felt his skills were high enough that she'd consider marriage and her father began to work out the arrangements. He decided to laugh in the face of tradition and make arrangements for a wedding during the Demon Moon (generally an unlucky time), picking the least favorable day. They agreed to a wedding on the 9th day of the Demon Moon. Bone Breaker convinced San and Chen that they should both marry as well, to strengthen their sect. Bone Breaker and Chen also discussed becoming sworn brothers. 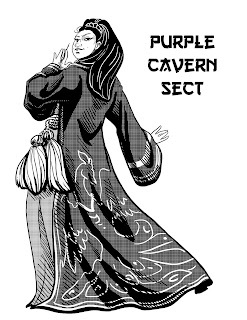 The party departed for Purple Caverns and reached it in about five days. They marched their army to the entrance and demanded Lady Plum Blossom speak with them. She came out and convinced Bone Breaker to enter the caverns with three of his people. After he threatened to wipe her out with his army, she told him that she believed the sword was possessed by a person named Zhi Zhu, who was more closely affiliated with Red Claw Gang through a mutual ally of their sects, Xi Kang. They also spoke with Lingsu, a member of Purple Cavern who was good friends with Xi Kang and Zhi Zhu. Lingsu offered to make a peaceful arrangement and work as go-between but Bone Breaker was too hellbent and demanded to know their whereabouts (which Lingsu was unable to reveal). Bone Breaker left and then immediately sent him men into the caverns. However the sect had already mostly fled by the point through a back entrance, and Lingsu and Lady Plum Blossom were no where to be found. They marched their men to Red Claw Fortress and had the flying Phantoms abduct the leader of the sect, Strange Phoenix. They beat her and threatened her with death but she refused to talk. When they threatened to wipe out the sect, she told them that Kang and Zhi Zhu were most likely at the Hen-Shi Tea house in Zun City. Pleased, Bone Breaker demanded she pledge loyalty to him and put her sect under his authority. She refused and he used the Bone Breaking stick to smash her skull. 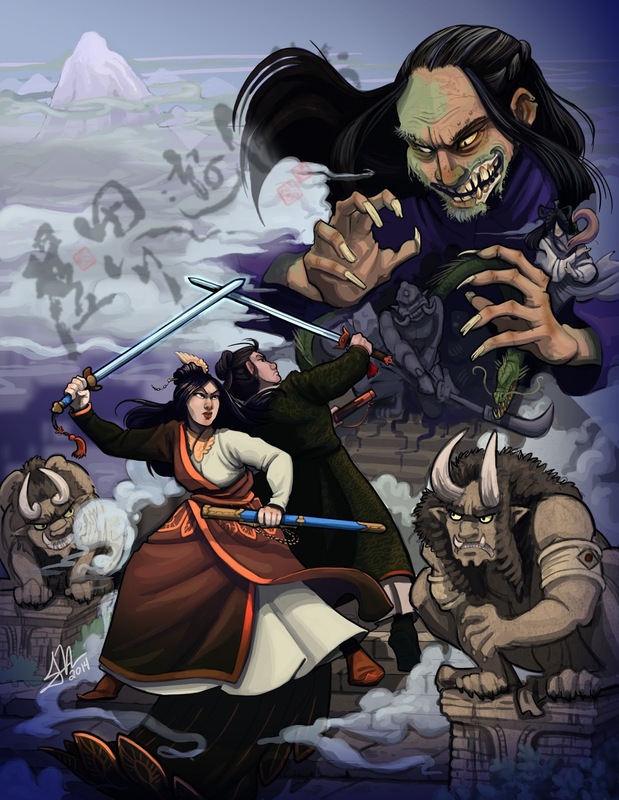 At Zun City they went to the Hen-Shi Tea House with six Flying Phantoms, Jade Priestess, Sand Demon, Abbot Fire Brand, and some of their soldiers. San and Chen went in first, to scope the place out. Chen ordered very expensive tea and San spotted Kang drinking at table. The party then surrounded him and Bone Breaker demanded the Wind Saber. Kang turned and said to him "You are ugly and have one arm; why should I give you the wind saber?" Abbot Firebrand approached and tried to smash in his face in with meteor hammer, but Kang used Dip of the Drunken Snake to evade the attack and replied with a powerful strike from his staff, sending Abbot back a few feet. They all rushed in, and Kang bashed several with his staff striking technique, wounding most of the party. As they closed in and started to wound him, Zhi Zhu appeared from the crowd and used Arms of Silk to entangle he party. The battle played out for a while, and lots of people on both sides shed blood. In the end the party had more people. They managed to kill Zhi Zhu and finished off Kang with the Flying Phantoms.